While choosing deer resistant perennials isn't foolproof, it can discourage deer from snacking on your flower garden. In rural and suburban areas, deer are a major pest in the garden. A hungry deer can decimate the garden overnight, eating shrubs and flowers down to stubs. By choosing unpalatable plants, deer move on to dine elsewhere. No plant is truly "deer proof." Hungry deer have been known to eat shrubs and the bark off of trees. But some plants don't taste very good to deer. They may nibble at them occasionally but they tend not to eat their way through the garden in one night. Spring can be the worst time for deer damage. If your area has experienced a particularly harsh winter, deer may be hungrier in the early spring and seeking any green plants for food. Certain early spring blooming flowers are typically deer resistant. These include daffodils, which, although technically are bulbs, do return year after year. Daffodils are also resistant to other wildlife such as squirrels who tend to dig up other bulbs, like tulips, for a snack. Other common spring blooming perennials that deer usually leave alone include primrose (Primula), Bleeding Heart (Dicentra), Lungwort (Pulmonaria), and False Indigo (Baptisia). Peonies (Paeonia) are also deer resitant. Deer not only dislike the flowers, they won't eat the foliage either. During the summer months, deer have more food to choose from in the wild. Grass and clover, their two favorite foods, are usually plentiful. Yet deer may still nibble on enticing flowers, so choosing summer blooming perennials deer don't like discourages them from damaging flowers. 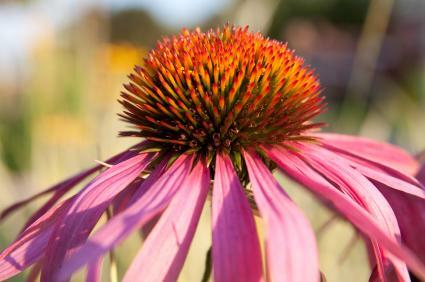 Echinacea: Whether you choose the traditional purple coneflower or the white, yellow or other colors now available on the market, all types of Echinacea are deer resistant. Platycodon: Platycodon, also called Balloon Flower, has large lantern-shaped purple or white flowers. They bloom early to mid summer and are deer resitant. Achillea (Yarrow): All types of yarrow discourage deer. The traditional yellow yarrow is quite popular, but other colors look great in the garden and are equally deer resistant. Coreopsis (Tickseed): Coreopsis spreads easily and comes in a variety of colors. It's also hardy and deer resistant, making it a great choice for gardens plagued by deer problems. Iris: Iris not only spread easily throughout the garden, but these showy sun-loving perennials are quite deer resistant. Herbs: Some perennial herbs are also disliked by deer and include lavender, oregano and mint. The only way to keep deer entirely out of a garden area is by erecting an eight foot fence or a smaller fence with an electric wire at the top. Deer can easily jump a standard garden fence, but adding an electric wire often keeps them out of the garden. Certain products repel deer but may contain harsh chemicals. Many home remedies keep deer out of the garden, too, such as placing slivers of soap or garlic around the plants, clumps of dog or human hair, or other items with a strong predator odor. Deer are resourceful and agile, and no method of repelling deer works 100 percent of the time. But by choosing deer resistant perennials and other plants, you've already done a great deal to deter deer from the garden. Deer may nibble on such plants to sample them, but once they get a taste, they will likely leave them alone.